Carbon nano-structures show great promise in many applications, including chemical and biological sensors. While carbon nanotubes (CNTs) have been extensively studied in that context for quite some time [1, 2], investigations of graphene as a sensor are only beginning to appear [3, 4, 5]. Sensory function of carbon nano-structures is generally implemented in the configuration of a field effect transistor (FET), with a prominent role played by the gate potential that controls the current through the device. Biochemical applications require good understanding of the interaction of carbon nano-structures with aqueous solutions , often in the context of the electrochemical top gating . 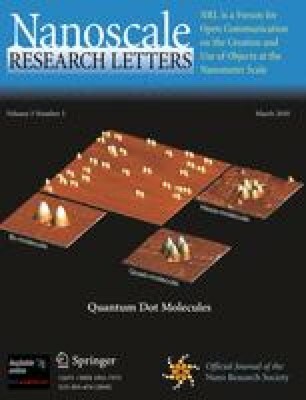 While significant progress has been achieved in understanding the interaction of CNT–FETs with the electrolytic environment [7, 8, 9], similar studies involving graphene have appeared only very recently , focusing on the screening effect of an ion solution on charge transport through graphene-based FETs , as well as on the measurement of the quantum capacitance of graphene as an ultimately thin electrode in an aqueous solution . On the other hand, referring to the electrical model of the electrolytic gating as a series connection of capacitors , the high gate capacitance in the electrolyte gives a much more prominent role to the quantum capacitance of graphene than does the back gate [11, 14, 15, 16]. In addition, doping levels of an electrolytically top-gated graphene have been reported recently  to be much higher than those obtained with the conventional back gate . At the same time, mobile ions in the solution seem to provide a much more effective screening of charged impurities underneath the graphene, thereby significantly increasing the charge carrier mobility in graphene in comparison with some other high-κ dielectric environments . All these facts indicate that electrolytic top gating provides a means to develop high-performance FETs. where Open image in new window with kB being the Boltzmann constant. We shall use in our calculations a full, non-linear expression for the π electron band density, ρ(ɛ), given in Eq. 14 of Ref. . 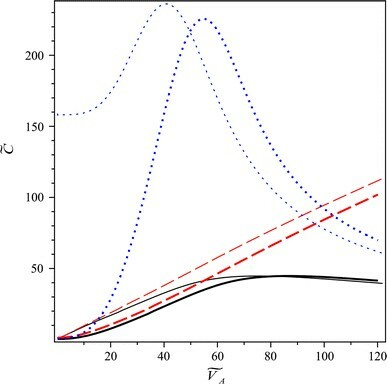 However, for the sake of transparency, the theoretical model for graphene will be outlined below within the linear density approximation, ρ(ɛ) ≈ ρL (ɛ). We note that this approximation is accurate enough for low to moderate doping levels, such that, e.g., Open image in new window , and it only incurs a relative error of up to a few percent when Open image in new window . We now use Eqs. 13and14in conjunction with the relation Open image in new window to eliminate the potential components Open image in new window and Open image in new window , and to evaluate the reduced density of doped charge carriers in graphene, Open image in new window , as a function of the reduced applied voltage Open image in new window and the reduced salt concentration Open image in new window . The results are shown in Figs. 1 and 2, covering the following ranges: Open image in new window (corresponding to Open image in new window (corresponding to Open image in new window ), and Open image in new window (corresponding to Open image in new window ). In Fig. 1, one notices a strong dependence of Open image in new window on the applied potential for Open image in new window greater than about 30, which gives approximately equal rates of change for each salt concentration at the highest values of the applied potential. On the other hand, at the lower applied potential values, there exists a much stronger dependence on the salt concentration, which is revealed in Fig. 2, showing Open image in new window versus Open image in new window for several applied voltages. Indeed, one notices a very strong sensitivity of the doped charge carrier density in graphene to the salt concentration for applied voltages Open image in new window in the range of salt concentrations Open image in new window . Even though this sensitivity seems to be the strongest at the lowest applied voltages, one should bear in mind that the electrical conductivity in graphene becomes rather uncertain around its minimum value, which extends up to doping densities about n ≈ 1011 cm−2[26, 27]. Therefore, it seems that Open image in new window would be an optimal range of applied voltages for sensor applications of the electrolytically top-gated graphene in probing salt concentrations in the sub-millimole range. showing that Open image in new window and Open image in new window are comparable in magnitude for vanishing potentials when the salt concentration is Open image in new window . Moreover, referring to Eq. 9as an electrical model where graphene and the EDL act as a series connection of capacitors, it follows that graphene’s quantum capacitance CQ will be promoted as the dominant contribution to the total gate capacitance as the salt concentration increases. We now use the equality of the right-hand-sides in Eqs. 13and14along with the relation Open image in new window to eliminate Open image in new window and Open image in new window and to evaluate the reduced quantum capacitance of graphene from Eq. 15, as well as the reduced capacitance of the EDL from Eq. 16as functions of the reduced applied voltage Open image in new window . Results are shown in Fig. 3 along with the total reduced capacitance of the system based on Eq. 9, for two reduced salt concentrations, Open image in new window = 1 and 105(corresponding to N ≈ 1.8 μM and 0.18 M, respectively). We show our results for the reduced applied voltages up to Open image in new window in order to elucidate the effect of saturation in the total capacitance that occurs at Open image in new window (corresponding to VA ≈ 2.21 V) for Open image in new window and at Open image in new window (corresponding to VA ≈ 1.95 V) for Open image in new window . As can be seen from dotted curves in Fig. 3, showing a non-monotonous dependence of the EDL capacitance on the applied voltage, the saturation effect in the total capacitance of the electrolytically top-gated graphene is a consequence of the steric effect of the electrolyte ions that are crowded at the graphene surface at high applied voltages . Even though the voltages where the saturation occurs are relatively high, they may still be accessible in experiments on graphene. Furthermore, we see in Fig. 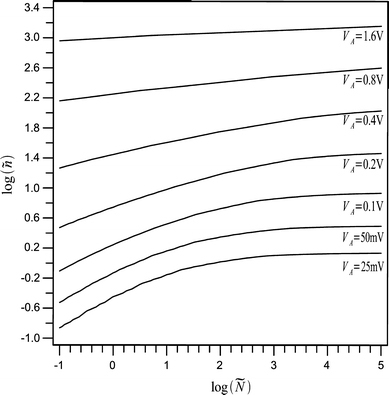 3 that at intermediate applied voltages, the rate of change of the total capacitance follows closely that of the quantum capacitance, with the value ≈23 μF/(V cm2) that is commensurate with recent measurement . At the lowest applied voltages, one notices in Fig. 3 a “rounding” of the total capacitance as a function of voltage for low salt concentrations, which comes from the EDL capacitance. 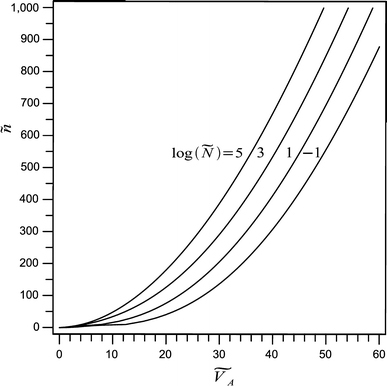 Such rounding is observed in the recent experiment . As a consequence of the vast differences between the capacitances shown in Fig. 3, one expects that there exists a broad variation in the way how the total applied voltage VA splits between the potential drop VD across the EDL and the voltage VQ pertaining to the change in graphene’s chemical potential. We therefore display in Fig. 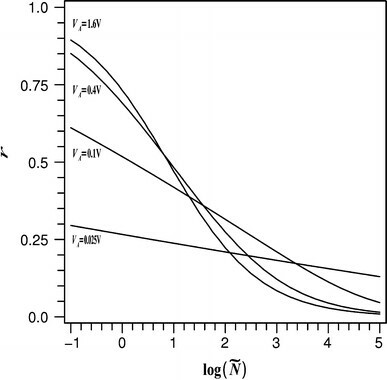 4 the variation of the fraction r = VD/VA as a function of the reduced salt concentration in the electrolyte Open image in new window for several values of the applied voltage VA. One can see that at low salt concentrations, the potentials VQ and VD are roughly comparable in magnitude, although the ratio r increases in favor of the potential drop across the electrolyte as the applied voltage increases. However, this trend is reversed at high salt concentrations and, more importantly, Fig. 4 shows that the most of the applied voltage is used to increase graphene’s chemical potential for a full range of applied voltages when salt concentration N exceeds, say, mM. Besides its importance for applications, the fact that the potential drop across the electrolyte remains very small at high applied voltages also alleviates concern that a high electric field in the electrolyte may cause the onset of voltage-dependent electrochemical reactions on graphene.